The congestion charge came into force on 17 February 2003. Capita were responsible for processing payments and fines until 31st October 2009. Initially set at £5, then raised on 4 July 2005 to £8 and £10 in 2011, the daily charge must be paid by the registered keeper of a vehicle that enters, leaves or moves around within the congestion charge zone between 7 a.m. and 6 p.m. (previously 6.30 p.m.), Monday to Friday, excluding public holidays in England and a period over Christmas. Drivers may pay the charge on the Web, by SMS text message, in shops equipped with a PayPoint, or by phone. The charge may be paid the day after at an increased cost of £12. In 2011 a new option called Autopay was introduced, enabling the driver to be billed once a month directly on its credit card or bank account by direct debit. Failure to pay the charge results in a fine of £120, reduced to £60 if paid within 14 days, but increased to £180 if unpaid after 28 days. IBM is now in charge and the system is mostly run on an automatic basis using Automatic Number Plate Recognition. In October 2007, a GPS based system for automatic payment was intoduced. Some vehicles such as buses, minibuses (over a certain size), taxis, emergency service vehicles (i.e., ambulances, fire engines and police vehicles), motorcycles, alternative fuel vehicles and bicycles are exempt from the charge although some of the exemptions are 100% discounts that still require registration. In the case of hybrid vehicles, the registration fee of £10 exceeds the congestion charge for one day. Residents of the zone are eligible for a 90% discount if they pay the charge for a week or more at once (note that there are administration charges for claiming the discount, presently the minimum administration charge is 10GBP). TfL can and does suspend the congestion charge either in a small local area to cope with incidents and if directed so by a police officer. The congestion charge was suspended on 7 July and 8 July 2005, in response to the terrorist attacks on London Transport. While private drivers are obliged to pay the charge either the day before, on the day or the following day, whether they are seen to enter the zone or not, the same does not apply to fleets of business vehicles. A business can register a group of cars with TfL, and is charged £7 per visit for all vehicles in the fleet detected by the cameras. In May 2005 businessman Miguel Camacho set up fivepounds.co.uk, whose sole function was to sign up private drivers to their "fleet", thus offering the convenience of not having to pay the charge pro-actively, avoiding fines in the case of a forgotten journey and also potentially getting a "free journey" if undetected by the cameras. Transport for London, 36% of whose charge revenue comes from fines, moved quickly to quash the loophole, by demanding that fleet operators provide V5 logbooks for each vehicle in their fleet. Fivepounds went out of business on 26 February 2006. Drivers of foreign-registered cars are not exempt from the charge but the current lack of an international legal framework for the assessment and collection of traffic fines makes enforcement and recovery difficult. In 2005 it was revealed that several London embassies were not paying the charge as they believed it to be a tax, which they are protected from paying under the Vienna Convention. Although some embassies have agreed to pay the charge, the US embassy currently owes £1,600,000 (approximately $3,000,000) in fines for non-payment, they do however, pay tolls in Oslo and Singapore. Transport for London argues that the charge is a toll, not a tax. 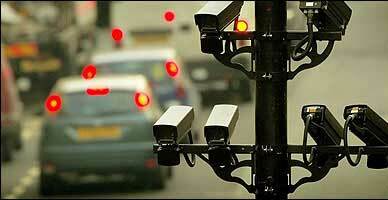 The scheme makes use of CCTV cameras which record vehicles entering and exiting the zone. They can record number plates with a 90% accuracy rate through Automatic number plate recognition (ANPR) technology. There are also a number of mobile camera units which may be deployed anywhere in the zone. The majority of vehicles within the zone are captured on camera. The cameras take two still pictures in colour and black and white and use infra red technology to identify the number plates on cars. These identified numbers are checked against the list of payees overnight by computer. In those cases when a number plate has not been recognised then they are checked by humans. Those that have paid but have not been seen in the central zone are not refunded, and those that have not paid and are seen are fined. The registered owner of such a vehicle is looked up in a database provided by the Driver and Vehicle Licensing Agency (DVLA), based in Swansea. The cameras can be fooled by tail gating or switching lanes at the correct time. TfL ran a six month trial of Tag and Beacon from February 2006 to replace the camera based system. This uses an electronic card affixed to the windscreen of a vehicle and can be used to produce "smart tolls" where charges can be varied dependent on time and direction of travel. This system automatically deducts the charge so that the 50,000 drivers a year who forget to pay the fine would not be penalised. Tfl has since adopted the autopay system whereby drivers can register their credit card or bank account to be automatically billed once a month.